Med-Tech environments - laboratories, medical offices, hospitals, and research facilities - demand seating that meet rigorous technical standards and provide all-day support and comfort. Cramer engineers every product to address these sensitive environments while providing performance and peace of mind. Every Cramer product is the result of rigorous engineering and design, tailored to meet the demanding standards of sensitive Med-Tech environments. Ever's simple and serviceable design extends the life of the chair without having to replace the entire frame. 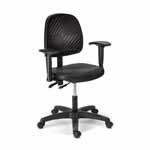 It features Cramer's quick-lock system that allows a user to replace both the seat and the back in seconds. The Fusion® series is Cramer's most popular and flexible line with dozens of configurable options and available with R+ Technology - a patented polyurethane cover system. This versatility makes Fusion a best-selling line that can fill a variety of roles in both lab and technical environments. Triton® chairs are engineered to withstand demanding Med-Tech environments and 24/7 usage. Triton delivers reliable performance and easy cleanability day after day.